Protestors outside Federal Court in Boston Monday morning. The latest front in the battle over affirmative action opens Monday in federal district court in Boston with a case alleging that Harvard University’s admissions process discriminates against Asian-American applicants. The lawsuit, brought by Students for Fair Admissions, a group representing Asian-American applicants, relies on six years of admissions data from Harvard and is likely to reveal closely-guarded secrets about how students get into one of the most competitive colleges in the world. 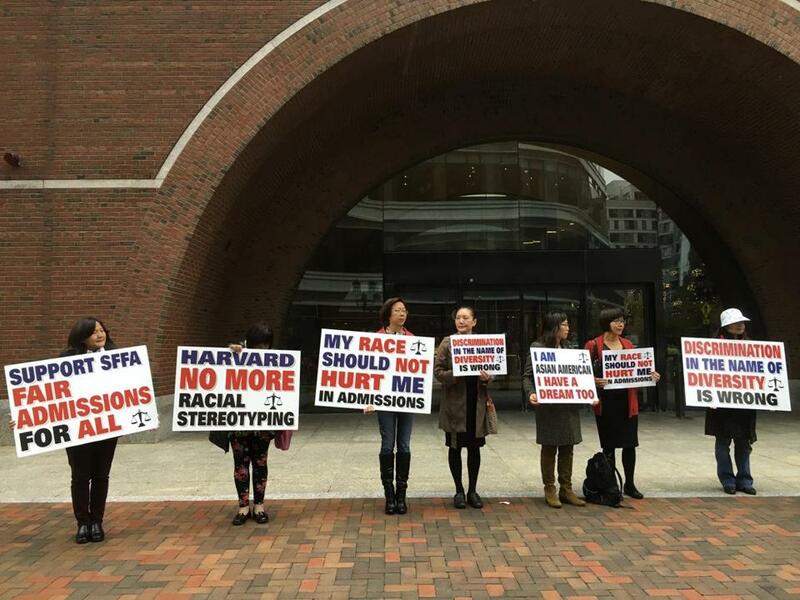 Students for Fair Admissions alleges that Harvard’s race-conscious admissions process, which puts a priority on having a diverse campus, discriminates against Asian-American applicants and caps how many of them it admits every year. While this case is about Harvard, an institution that enrolls only about 1,600 freshmen from a pool of more than 42,000 applicants every year, it is being closely watched because it could offer opponents of affirmative action an opportunity to limit race-conscious admissions in higher education more broadly. The trial is likely to put some of Harvard’s most senior administrators on the stand to defend its policies. 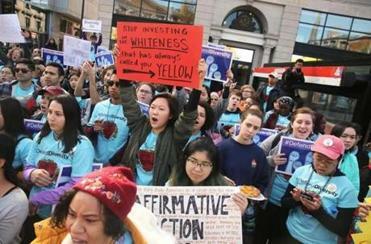 Harvard students, alumni, and employees marched in support of affirmative action in admissions while opponents rallied against it. Here’s a rundown of the major players in this case and what to expect in the coming few weeks. ■ Harvard administrators. William Fitzsimmons, the university’s dean of admissions; Drew Faust, its president until this past June; and Rakesh Khurana, dean of Harvard College, are all expected to take the stand. Fitzsimmons, known as “Fitz,” has outlasted several Harvard presidents and has overseen the college’s admissions process for more than 30 years. He will be the first to testify. ■ Edward Blum. The conservative activist and leader of Students for Fair Admissions is either a tireless advocate for race-blind admissions, or an opportunist looking to undo decades of civil rights legislation by recruiting Asian-Americans to his cause, depending on which side of the issue you stand. Blum, who unsuccessfully challenged affirmative action in the recent University of Texas case involving a white student, will not testify in the Harvard trial. But he will likely be a daily presence in the courtroom. ■ The students. Students for Fair Admissions doesn’t plan to call any students who have been rejected by Harvard to testify. But the judge has allowed Harvard students who support affirmative action to testify about their experiences in admissions and diversity at the college. ■ The experts. The nuts and bolts of the case hinge on the analysis of dueling economists who use different methodologies to come to conflicting conclusions about whether the university discriminates against Asian-Americans. Harvard’s expert, David Card, from the University of California, Berkeley, found no evidence of discrimination. Peter Arcidiacono, a professor at Duke University who examined the data for Students for Fair Admissions, concluded that Asian-American students were disadvantaged by Harvard’s process. Both will testify in the case. ■ The judge. Allison Dale Burroughs is a former prosecutor who was nominated to federal district court in 2014 by President Obama. In January 2017, she blocked an executive order issued by President Trump meant to bar entry to the United States for refugees and immigrants from seven predominantly Muslim countries. Earlier this year she warned Harvard, which has been reluctant to release its admissions data in open court, to be careful about unnecessarily redacting huge amounts of information. The trial is expected to last about three weeks. It is unclear how long Burroughs will take to make her ruling. Ultimately the case is expected to land at the US Supreme Court.